The popular PewDiePie sim comes to consoles, but is it worth the wait? 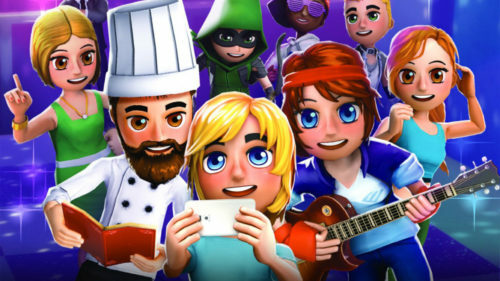 Youtubers Life originally hit YouTube Let’s Play thumbnails with its release back in May 2016, but I hadn’t heard much of it until this console port in the form of the ‘OMG Edition’, and with it the chance to pursue your own career in the online video marketplace. Is it a satisfying sim with depth, or a hollow cash-grab with a shockingly shallow smattering of content? Well, a bit of both. Upon starting your U-Tube career (which is what it’s called in-game, perhaps for copyright reasons), you’re living at home with your mum and have little going for you. Your bank balance is meagre, your bedroom is cramped, and you’re struggling to balance a social life with studying for an upcoming, yet fairly nondescript, exam. So you decide to make a little side hustle, and plug in that camera to film yourself doing one of three things: gaming, cooking, or making music. Each of these come with their own set of mechanics and requirements, and there’s a surprising amount of variety depending on the pathway you choose. I opted for gaming like the sweaty nerd I am, and got to work making budget videos on a cheap rig. Video production in Youtubers Life is as simple as choosing a reaction to the same cycle of events, and then subsequently cutting everything together in a simplistic minigame that sees certain segments fitting (or not) into others. It’s then time to publish your video to the internet, and see what kind of death threats will litter your comment section. And that’s kind of it. I mean, there’s events to attend and friendships to make, but Youtubers Life is largely about making a video to earn money, so that you can buy better equipment, to then make higher budget (read: longer) videos that generate more viewership and more money. Yes, you can work on relationships with fellow millennials, and even get married, but these other actions contribute so little to the actual gameplay loop that they almost seem irrelevant. Making friendships at events (which boil down to discos, cinema outings, or one-room conventions) largely means your acquaintances will come knocking when they want content produced, which then generates money, which then lets you make more content – see where this is going, again? Even having a husband or wife doesn’t add much, besides the fact they’ll linger around your home and occasionally spend money on decorations or clothing. There are some variables in the gameplay beyond your chosen content creator career, but they’re largely insignificant in an experience that’s already lacking in much staying-power. You can purchase various consoles, for example, which allow you to buy respective games. This ties in to a small statistic that dictates market share, as certain consoles will have a lifespan that rises and falls like in real life. But it doesn’t actually change anything. Videos will still be made by clicking one of a set of reactions, which generate coloured stats, which eventually determine how successful your video will be. Rinse and repeat, until you afford a mansion and beyond. And yet, despite all this, I did find myself oddly immersed in the experience. Once I muted the horrifically repetitive music and put on a podcast for some background noise, I discovered a strange sense of ownership and satisfaction from watching the numbers pile in and my bank balance getting larger and larger. I don’t know if this is down to the development team or my own dopamine addiction, but I had a brief window where the steadily climbing popularity of my channel – ‘RichBois’ – gave me a rush that I imagine real life YouTubers experience everyday. However, all of this came to a grinding halt with the game-breaking bug I encountered that meant I couldn’t attend a convention. The convention in question allowed me to progress to a further apartment and pursue greatness, so I was effectively stuck without any ability to continue. And then I started noticing other bugs. Like how you would sometimes get stuck in a piece of furniture and have to return to the menu in order to escape, or how sometimes the ‘collaborate’ option on a video simply wouldn’t work, effectively failing any future challenges that required this. Being forced to wait around for a patch also made me notice some sloppiness in other areas, such as typos, incorrect male pronouns for female NPCs, and an increasingly cluttered interface that doesn’t fully explain all of its features. It’s true that some of these issues I had might have been ignored by players who could seamlessly transition from one stage of the game to the next. It’s also true, though, that a totally game-breaking bug is not a good sign for a full-priced console release – especially of a title that’s now over two years old. A small patch has already fixed some features, but the brick wall I’ve hit with the essential convention still hasn’t been updated. If these issues do all get fixed, then there’s definitely something worth at least tying out here. The meditative quality to watching stats climb has merit, and there’s inarguably fun to be had with Youtubers Life’s quirky aesthetic. But, as-is, it’s a hard recommendation. Put simply: if you play nothing but The Sims and value simplicity in your gameplay (bordering on child-like sparsity), then you’ll get a kick out of making videos and pursuing wealth and fortune. If you want something with a little depth, though, then looking elsewhere could be a better use of your time. Youtubers Life: OMG Edition has a cutesy look that mirrors its gameplay: easy-going, if very basic. It'll keep you entertained between games, but it's hardly worth a lengthy investment. Earth Defense Force: Iron Rain shakes up the series at its core, and still manages to be a decidedly great EDF game. Did you get the message? This is a great game. Massira has a good heart and compelling visuals, but the story and the message it offers within are lost in an unrefined and mediocre game.